You've taken control of a single crewmen. Now to build up to fleet! You've fought a very powerful alien vessel, and lost. You'e alone in the galaxy. Find help! You've completed the tutorial, now upgrade your starmap to unlock all available planets! 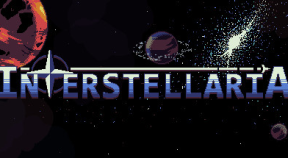 Hey, it's the Interstellaria! So that's what it is! Adventure onto a planet without other crewmen. Maybe your crewmen has the illusion of free will? Robots listen to orders. They can't carry guns or armor. No understanding between the hand and brain without hearts as mediators. Trading is the most lucrative method of getting money! Abduuuctoooorssss!! You've taken one on in person, and lived! You've beaten a stereotypical villian, but what was his motivation? You've aided in an important clean up! Your action may have changed the course of the future. We've found an important world to the enemy. Where will it lead us? Find a hidden sector of space. You've met with a shady character. You've traveled to an odd planet, and found important imformation. You took on a big enemy. You've stopped the aductions, and claimed the $1,000,000dy reward! A crewmen has made a new friend. For life. Take on 3 ships with 1, and win!